Which would make Dave a Dingle-Barry. At least it won't ruin a blue shirt. Also, I should point out that Inflatable Poop WBAGNFARB. Hey, my third first! Yay me! Dave seems to have developed a real penchant for standing between the legs and under the unmentionable areas of large male objects. I think I'm worried. Suzy Q ~ It does seem to be a disturbing trend. DAVE: "Excuse me ma'am, can you please move your kids off of Snoopy?" Dave and the Giant Statues (wbagnfarb?) tour, Summer 2005! Dave, I once had a summer job watering plants & trees inside Camp Snoopy! Yee Haw! just a question... who would want to inflate poop? personally, i'll let someone else be the one to blow it up. Is that one of those moonwalk things? Can we have one of those at the oft thought of but never been planned eventual Barry-Blog and Blogette get together? Dave i triple dog dare you to come back in February and have your picture taken in front of all the same things wearing the same clothes. Unless of coarse you are back writting your column. poop could fall, Good Grief! Someone help Dave, he's looking for peanuts. He was in school, and was supposed to be reading when he nodded off. He had been resting his face in his hands and his elbows on his knees. (He was seated at a table, not one of those desks with the fixed seat.) So, his elbows slipped off his knees, and he awoke to find his head between his knees. He quickly reared up hoping to avoid the embarrassment of being caught sleeping only to loudly bounce his head off the underside of the table, which of course, attracted everyones' attention. I told him that if he had only managed to fart simultaneously he would have elligible for the Embarrassment Hall of Fame. Was the giant inflatable poop filled with helium? Or was it a denser substance like vaporized Iron? Or am i trying too hard to analyze. my, what is that smell? 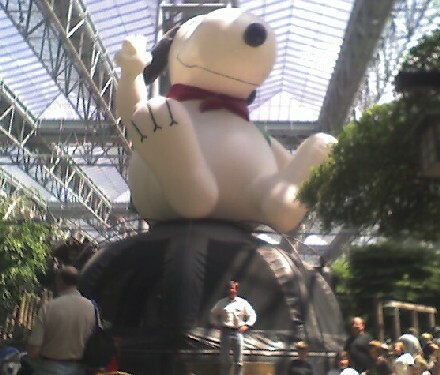 See what happens when Snoopy hovers? It almost gets on Dave. Boy- with all this serious talk about poop I would swear everyone in the blog has a new-born in the house. (name) - and if not a newborn, then perhaps a dog. I personally own a 106 pound Doberman Pooper. Now that I look closely at the picture, I'm not entirely sure that Snoopy isn't flipping us the Woodstock, IYKWIM. Though, to be fair to Snoopy, you can't possibly point your middle finger at someone when you only have 4 fingers. Which just goes to prove my point. Men claim they never fart; they just always happen to be standing by a dog who did. Since you are in the neighborhood, it would be a SHAME to miss the SPAM Museum! I know that standing under a giant SPAM always makes ME feel inadequate, and since this seems to be "Dave's Inadequate Tour - 2005" ....Go4it ! the guy in the front left corner of the picture appears suspicious to me. I think it's the combination of the backpack and the extreme hair loss. are these things going to be in the macy's parade? is that their one time to leave minne-sota? Know what you mean. I have travelled around the world, and if there (not their or they're) is one thing I have learned, it is this. Evil does not come from [edited by request] or any such group. Not - Please accept apology, did not mean to offend. Put the words in quotes to emphasize that I do not use them. Poor taste. Not again. not - please reread and check your (not you're) sense of humo(u)r.
(name) - I got the joke, but there are some people who really take offense at anything that might possibly be construed as having some semblance of being vaguely politically incorrect... please refrain from trying to be funny in the future. mudstuffin, LOL! You've got to post that other fart story again, unless you already have somewhere else, in which case never mind. The other night on Leno, he did a segment about "shopping at the 99 cent store". One of the things he'd bought was a candy bar that a foreign company had labeled: "Fart" bar. So last night, we're putting the kids to bed, and the girls heard a "little noise" from somewhere around Dad's vicinity, and the oldest girl asks, "Daddy, did you just cut the cheese?" and I said, "No, honey. Daddy was unwrapping a candy bar." OK, maybe not funny now, but it was funny then. Guess you had to be there. Aunt Nance: I'm sure he was standing next to the dog at the time. Amy!!! Nice to see you! How are you? Busy being the mistress of the night. If you know what I mean.